The tremendous Light and Love that the Ascended Host are releasing through the New Dispensation knows no bounds. It is for the need of the hour, that all may know of the Words and Directives from the Master's Heart, that these words are written. The May 21, 1999 weekend brought the fourth anniversary of Morya's notification to the Messengers that He, Morya had received a New Dispensation for the founding of The Temple of The Presence. In a stunning Dictation, Morya charged all of us present and those participating via the Internet, with the Fire of the Will of God. The theme of the Discourse and the Dictation was the unmitigated thrust of the Will of God, through the First Ray Chohan, in bringing forth the awareness of the new Activity that is holding the Ascended Masters' Presence before the world. Morya also said that more Violet Fire is needed by the Lightbearers. I regret that I am not able to convey all the points of His Dictation to you, but He did say that The Entire Spirit of the Great White Brotherhood is Directing and Supporting the Internet broadcasts of the Services of The Temple of The Presence. Morya did say that many will oppose these Releases - but that many more need them. He charged us all to do what we came here to do, and be about our Father's business. During the Sunday Service, the Discourse was about, and brought us into consonance, with our own I AM Presence. Then Lord Maitreya came in the Whirlwind of the Infinity of Christ Love, and held the Heart Flames of the Lightbearers in the Ray of their own God Presence, and His own God Consciousness. It is impossible to describe what it is like to be in the Presence of the Master. There is a pattern that it takes a few days of being caught up in the Services of The Temple of The Presence before one's aura is able to integrate and participate in the fullness of the Releases of Light that takes place. This is why Godfre conducted the early I AM seminars over many days, and this is why The Temple of The Presence quarterly conferences also go on for 4 to 12 days. On a personal note, some may think me audacious to write in this manner of The Temple of The Presence. I stand ready to serve Life in any way I can. The experiences of the 49 years I've had in this body lend credence to my words. These feet have physically climbed the hills of Glastonbury, Jerusalem, and Darjeeling in this lifetime, and I humbly wear Lord Michael's Gifts of continued Opportunity to serve in God's Name. For those new to these forums, I was the recipient of Lord Michael's intercession - and Lord Michael gave a Dictation through Elizabeth Clare Prophet in April of 1986 in which He said why He gave me this Gift. She had elaborated upon this prior to the Dictation. Many who have read these posts by those of us who know the reality of The Temple of The Presence, have also contacted and experienced The Temple of The Presence for themselves. If just one daughter or son of God was able to re-connect with their own Presence through our humble efforts, all this would be worthwhile. Many on these forums have made this connection with The Temple of The Presence. Friday . . . . How does one describe what it is like to be in the Presence of the Lord of the World, to be instructed by His Messengers in meditation so that we could all receive most deeply of the Gift of His Consciousness, the Gift of His Instruction, the Gift of His Peace? It is a Wesak that we will need to integrate into our lives forever. Saturday . . . . Saint Germain's Ascension Day, was filled with Violet Fire - hours of Decrees to the Violet Flame and then our Mother Mary comes and prepares the way for Saint Germain. Mother Mary's Instruction and Her Action was to place our hand in Saint Germain's. The little that I can describe of Her Dictation is that She and Saint Germain have already raised a Christed One. We should accept Their offer to Raise and Guide us too. All day Saturday and into the evening, the greening hills of Vermont were humming with the Violet Flame, the buds were bursting in the trees as Spring and the Resurrection Fire brought forth Their perfect work. The clear electric blue of the sky was the color of Mother Mary's eyes. The Joy was almost too much. And then Saint Germain came. . . . .
Tears come to my eyes as I remember His approach. How do I tell you of the rapture to be caught up in the hem of His Aura - to be held in His Heart that is the Hope of the world - to feel your bodies bubble and explode with the Joy of the Violet Fire. He talked of our Ascension - and He made us laugh. This Prince of the Central Sun made us laugh . . . . Take the joy of a child on Christmas morning and multiply it hundreds of times . . . . you are coming close to where He brought us. I fell asleep that night hugging myself. This is how a 49 year old man becomes a little child. Sunday morning was another day made for Vermont. Helios and Vesta rising over the green hills, set the example for us. The pasture and the hills were awash with a gentle, fragrant, warm breeze and the birds were singing many songs - the deer grazing in the fields. Good coffee and beautiful friends still so dazed by Saint Germain . . . . no need to talk in this "maternity ward of Gods". . . . And then the Maha Chohan comes. Remember, I have shared with you before, that you often need a "visa" when attending a Service with The Temple of The Presence because of the great distance you may travel. This was again the case as the Maha Chohan took us all into the Great Sea of Light. Imagine being this Infinite Essence of the Wholeness of God - so pregnant with Love, floating in this soft White and Golden Luminescence - being the Center of Peace by which stars are born. God grant you the Heart to feel . . . . . . .
Lord Ling (also known as Moses) gave a stunning Release of Sacred Fire for the sealing of the astral plane that has been contaminating the consciousness of the Children of the Sun. With the fullest Intensity of the Fire of Divine Love, Lord Ling told us all to "Wake Up" . . . . . that the astral plane has so permeated the consciousness of humanity that the horrors and violence are just spewing forth into the physical plane around the Earth. I believe that He said that there are enough Light Bearers embodied now to hold the Balance, but that All need to be absolutely anchored in the Love and Light of their I AM Presence and free from every vibration that is less than the Perfection of the Christ. The Teaching delivered by Lord Ling and in Monroe Shearer's Discourse has been consistent with most of the Dictations and Discourses released through The Temple of The Presence, this being that we have to stretch to become the Christ . . . . . to assert our Christ Identity now . . . . . to be the action of the mighty fiat "The Earth is the Lord's and the Fullness thereof . . . . . " However, it must be noted that for the past months, that the Magnitude of Intensity, of the Fire released in the Dictations, has increased to such a point that it is all but physically overwhelming to be present for. It is as if the Ascended Hosts are Increasing the Power of Their Releases to counteract the mounting Illusions of horror on this planet. Discourse on Cultivating The Sense of Sacredness We all at one time lived in a consciousness of the Ascended Realm. Somewhere we accepted a less perfect outpicturing - one where the Ascended Host may not be. The Path of the Ascension is not one where we just bask in the Light, as at a Spiritual Spa, we must use that Light for world service. Nothing may be with in an Ascended Master Aura but perfection. The "sense" of the Sacred and Holy is not native to the 20th Century western life. We need to have the determination to create the Sacredness of our temples and that space we occupy. We have the gift this century of the scientific understanding of the reality of the God Being that we are. God (your IAM Presence) will not arm wrestle with you to be able to be in your presence - He and the Masters will be obliged to withdraw in the face of inharmony. There are habits to adopt to maintain the Sacredness of your Being - removing yourself from those things that disturb the harmony of your connection with the Presence. Guard against recreational involvement in inharmony but bring your connection with your perfection to bear on human conditions where needed. Handling human conditions should be done only enough to acquaint yourself with what the calls need to be for the transmutation of the conditions, not pouring your Light in to the conditions themselves - thereby strengthening them. Anchor your consciousness in the God Reality of all situations, like Gautama Buddha, by seeing through the Maya and Illusion that would captivate your attention if you let it. The reason for this Discourse is a reminding of the need to individually garner and draw forth the Light of the Presence from the Causal Body and grow past the pattern of trying to exist solely on the gift of life that the Masters bring in their visits. That gift is the gift of their Presence, not the accumulation of actions while in unascended embodiment! Our task is to draw forth the Gift of our own Presence for our own benefit and that of others and the Planet. Beloved Lord Ling is known for Joy and Love in that embodiment but also has been known for intolerance of entertaining the astral plane as Moses. He came as the Father to remind us of our responsibility to hold to the Perfection of our Presence. He has seen the level of the astral pit open to the children that have not the ability to fly above it on their own or to make discerning choices of vibration. The answer is the Love of God in enough lifestreams to be the example for others and to close the avenue for the astral energy to emerge - hold fast to the Protection of Archangel Michael where there is a more than ordinary opening to the pit. Archangel Michael has been given a new activity to initiate to offer an increased Protection for those lifestreams at greatest risk - the Father sends forth extra Light to aid in the surcease of pressure from the astral realms. Take the Sword of Truth and illumine the planet. The Lords of Karma have given a Dispensation to take all who are removed from embodiment by violent means immediately to the etheric realms and have the record of that violence removed from their memory body to avoid a scarring of their being by that record. We all need to bring forth the Light of our own God Presence and the Great Central Sun to aid Archangel Michael in this work. This day in Chelsea, Vermont Lord Maitreya released the Fire of His Office into the Chalices, of the upraised hearts, of all who are open to the Christic Light. His Instruction is to be the Christic Fire now, that all of our burdens and those of our Earth, may be Light. Also, this day at the same time, in the Spirit of the Cosmic Christ, in a geographically separate service, representatives of The Temple of The Presence conducted joint services with numerous representatives of the Bridge to Freedom activity. During this joint service, in adoration of the Presence of God, Jesus' Easter Sunday Dictation was the capstone of the Service. Thus it is demonstrated that Saint Germain and Morya's new Activity, knows no bounds in bringing together all those whose hearts beat with the pulse of the Prince of Peace. For the many of you who have expressed a desire to join us in a Service, there is the transmitting of live Services, including Discourses and Dictations over the Internet. Please check The Temple of The Presence web site for details. During a Service today in Chelsea, Vermont, the God Tabor gave an intense Dictation anchoring another aspect of the Resurrection Fire into the Earth . . . . . allowing Elemental Life to continue to hold the balance in the face of mounting human mis-creation on the planet. The God Tabor said that much more Violet Flame is needed from the Lightbearers. In a solemn, comprehensive Discourse - quoting the Psalms of David - Monroe, overshadowed by Jesus (I believe) and perhaps others of the Ascended Host, gave a teaching on the responsibility of Elemental Life, and the tremendous weight of human mis-creation that imprisons Elemental Life. The Teaching that was given in the Discourse and in God Tabor's Dictation immediately after, is summed up in the mighty fiat "The Earth is the Lord's and the Fullness thereof . . . . . " It was explained that this mighty fiat is the thought form to reinforce each one, in the Heart of their Presence, in the face of the mounting human miasma that covers the Earth. Please, no matter what your feelings on The Temple of The Presence, increase your Violet Flame Decrees for "The Earth is the Lord's and the Fullness thereof . . . . . " The Ascended Host need all of us working together for all Life . . . . . now. of ASCENDED MASTER TEACHINGS 24 / 7 for FREE! Join those who already know that just one click with their computer mouse can open the doorway to a higher dimension, a dimension radiating with Ascended Master Light, Love and Wisdom - 24 hours a day! Listen for FREE to as many Dictations and Discourses as you want, whenever you want. Any time you are ready to commune with the Ascended Masters and Angelic Hosts or increase your understanding of Cosmic Law and expand your experience of your Divine Identity and Inheritance, just one click on the Perpetual Voice broadcast link button can bring you more Light from the higher octaves than you have ever known before. And it’s all free! You can access Perpetual Voice at any time night or day by going to www.templeofthepresence.org and clicking on Helios Broadcasting, select your connection speed, and then sit back, relax and enjoy the Discourse or Dictation currently playing! Perpetual Voice provides a perfect oasis of Ascended Master Light, Love, Wisdom, Harmony and Joy anytime you need a lift in consciousness! Let Perpetual Voice give a regular boost of Light to your life, and you will truly experience an expansion of understanding and awareness of your God Identity and Divine Blueprint! Start listening to Perpetual Voice today! 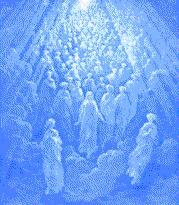 Link to Discourses and Dictations from the Ascended Masters.